This is a horse of course. I freehanded it. No Tracing. Nothing. Just natural talent. (not trying to brag...seriously)I LOVE to draw and this is something that I drew up. It took me approximately 15-20 min. at minimum. Please don't give me any junk about it, I worked hard and I CAN do better. Thanks! That drawing is insane!! How long did it take you to make it?? Its AWESOME!! THAT PIC ROCKS!!! You go, cowgirl! Gosh! I wish I could draw like that! Great job mystery girl... I think that was your name... Well done! It looks like out of a book! Any more? Luv it!! I could never do that, that's the best! You've really made my day. Keep up the good work! Wow! Amazing Shading! 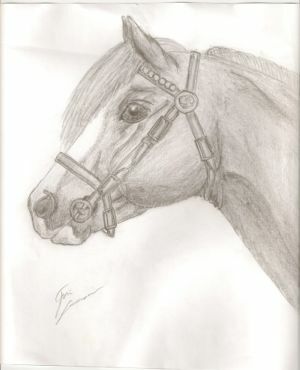 I draw horse pictures too and shade them, but you are awesome! that is amazing best welsh pony drawing head i've seen in a very long time. Awesome drawing keep it up you might be an artist someday! AMAZING!!!!!!!!!!!!!!!!!!! U R soooooo good! You should be an artist! Keep it up. i think this is awesome good job! It reminds me of some of my rushed drawings too. Very good. that is... i don't no what to say but that's fabulous! don't give you any junk? How could anyone say something junky about that? You have natural talent. It's beautiful! i like the way the bridle has detail! You're awesome at horse drawings! I love your drawing! It is the best I have seen yet! I am going to try to draw it.... but with a different bridle.... great pic! So far, this is the BEST drawing I have seen! I can't even draw this good and I am really good at drawing... horses at least :) And if you can really draw better than this one, then you should def put it on so we can see it! BEST DRAWING EVER!! I tried to draw this but I couldn't. It is so good! Great job!!!! omg! it is so cute, I must say that is really good. I am good at sketching and drawing but that is good. This drawing is just amazing!! I'll have to put mine on here!! Wow i wish i could draw as good, if you wanna see how rubbish i am, then look at my drawing, running free. Wow that is so good. Your better than me and my friends said i am really good. How do you do that??? this is like the best horse drawing on earth! you draw soooo good! wow! wow that is way better than me! and I am the best of my friends! I love that Welsh pony you drew!!! The halter was a nice touch! I WOULD NEVER SAY JUNK ABOUT THIS BEAUTIFUL PIC AND I'M SERIOUS IT IS BEAUTIFUL! by: Rider in the Mist. I wish I couild draw like you! I would never say any junk about your AMAZING artwork! u R SOO good at drawings this is AWESOME and its free draw ps that horse is soo beautiful!! Your drawing is really good! I wisk I could draw as good as you can! If you can make this in 20 min., I wounder what you could make out of a drawing that would take a couple of hours! You are really good. This is amazing! Send in more! !